WASHINGTON — The two-man aircrew that battled frostbite to safely land an EA-18G Growlerblind after a catastrophic failure of the cockpit oxygen and climate control system has been officially recognized for exceptional airmanship. 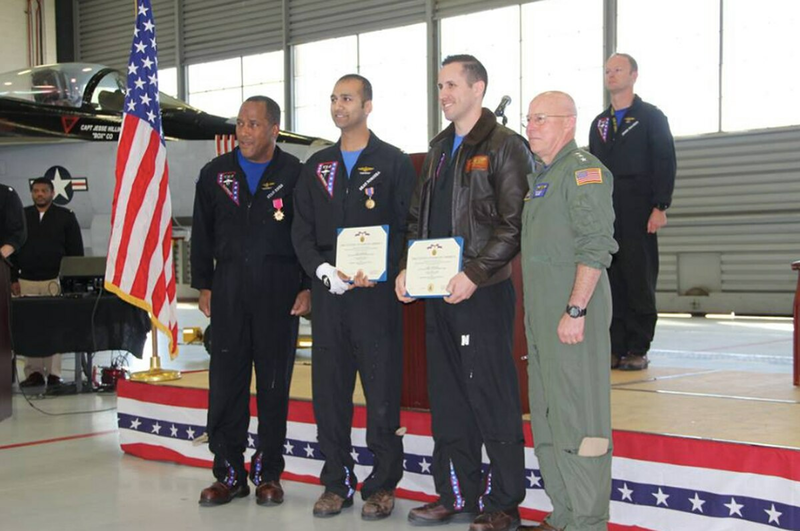 The U.S. Navy’s top aviator, Vice Adm. DeWolfe Miller III, awarded Air Medals to Lt. Jason Hirzel and Lt. Sean Noronha, an award given for aircrew who “distinguish themselves by heroic or meritorious achievement while participating in aerial flight,” according to the instruction. Miller’s spokesman said Hirzel and Noronha, both assigned to the elite Air Test and Evaluation Squadron Nine, went well beyond the call of duty to land the stricken Growler. Noronha and Hirzel were cruising at 25,000 feet on Jan. 29 — about 60 miles south of Seattle on a flight from Washington state’s Naval Air Station Whidbey Island to Naval Weapons Station China Lake — when the Growler’s environmental control system issued an icing warning, then failed completely. The temperature in the cockpit plummeted to minus 30 degrees Fahrenheit, and the system began filling the cabin with a mist that covered everything, including instruments, with a sheet of ice. Without so much as a window to see out of or instruments to guide them, the crew used a Garmin watch to track their heading and altitude while a tremendous effort from Whidbey Island’s ground control team guided the Growler safely back. The maneuver was something close to driving fast through a busy part of town and parking the car while blindfolded, relying fully on a voice in your ear for each turn of the wheel. Both pilots were rushed for medical treatment, having suffered from frostbite. One pilot has returned to flight status and the other is expected to make a full recovery and be up in the air again soon, Flanders said, but could not elaborate due to privacy protections. The incident was a reminder of the Navy’s struggle with containing a recent rash of physiological episodes, many of which trace back to the environmental control system. The service has made some progress in the physiological episodes fight, especially in the T-45 training jets. The rate of physiological episodes in the T-45 aircraft has dropped from about three a month at the peak in 2016 to about one a month since last September’s grounding.